Yes, I know it's talking about adopting an animal. I'm all for that. And I also don't care when adoption is used to talk about things that are not like adoption -- highways, stars, zoo animals, liberals . . . . But a friend sent the photo to me, and it reminded me of how much I dislike the rescue meme, which I've written about before. Oh, and the trailer is quite frank about one thing -- the rescue isn't just saving a life, it's "collecting lost little ones" to save their souls. What else could adoption be about, huh? I'm a Christian, but generally, I dislike my religion's approach to adoption. This video is very unfortunate. I'm sure the creators of this movie are well-meaning but this "rescue" idea will not prepare families well for many of the challenges that come with adoption and it feels like this idealistic approach may set some children up for "failure". Even though I understand and get the concept you are trying to make, that the number one priority to adoption should not be to "save" the orphans. But, with all due respect, unfortunately, anyone can take anything and dissect it to call it whatever they want. At the end, one of the parents did say, "We are not a family of adopted children. We are just a family". Someone could have just as easily quoted that piece of the 'commercial' and gone with that angle too. I also cringe at the idea that someone's priority to adoption is to save an orphan. And children adopted by said people should NOT have to grow up knowing or hearing about how they were 'saved', and/or that they should grow up to be the 'voice' for others who also need to be saved. What a huge burden to place on ANYONE. However, in some cases it is just that. Children in China age out at 14 years old. Children in the foster care system in the US are tossed on the street on their 18th birthday, unless they have a loving foster family who will continue to guide that adult-child long after his/her 18th birthday. So, to attach a label to (in your example-many times over) Christians or people of faith in God, that they are crusaders out to save orphans, is IMO, also unfortunate. Not all Christians are out to rescue the orphans when they adopt. Not all orphans need rescuing. But some do. Some will never reach adulthood without adopting them. Some will not continue to receive love and/or guidance after they 'age out'. 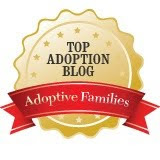 There's a space for all aspects of adoption. Before anyone jumps on a sentence of mine...please put ALL that I am saying into perspective and realize that I am not saying that all orphans and all children who do not have guidance from their own parents (foster children) NEED to be saved, nor am I saying that people who see adoption as being a child's savior is a good thing. Nor that children should carry any of that burden. I'm saying that there is are times when children DO need to be sheltered, saved, rescued...whatever you want to call it. But it's not as often as some think . I have to agree with Anon. 2 in part; when did it become a dirty word to "save" or rescue a child in true need. Indeed forcing that child to recognize it is shameful, but honestly our children would be dead or on the streets at age 14 if not for a loving placement in our family. Was that our rationale for adopting? NO. Maybe therein lies the difference? The perception of motive of the adoptive parent?